Single tool bushing - The single lower combined bushing/thrust ring can be replaced in 10 minutes. No recharging - The sealed accumulator membrane holds the charge indefinitely. Modern design - The streamlined shape makes it easy to access narrow spaces. The working height is optimized and the flat top allows quick attach mounting. Total protection - The housing protects the body of the breaker, and enhances the noise reduction system. 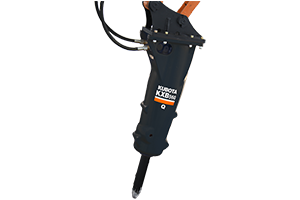 The isolated powercell provides the ultimate vibration dampening, which protects the environment, operator and breaker. Service friendly - With 30% fewer parts, the breaker is easier to maintain and service. The breaker can be re-assembled and re-sealed in 45 minutes. Operating Pressure - 2030 psi. 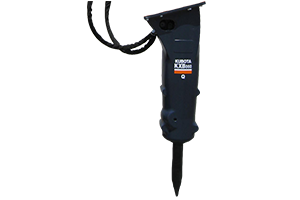 The KXB560Q Breakers are available at Kooy Brothers, located at 1919 Wilson Ave., Toronto, Ontario.